Everything I’d assumed about the godforsaken island of Cocotúe was wrong. The minute I glimpsed the place destined to be my home for the upcoming year, I realized I’d been completely mistaken. I’d have to revise my suppositions, because this was the furthest thing from dark and depressing that I’d ever seen. Oh, I’d known well enough that southern Chile would be lush and beautiful—if it wasn’t pouring rain. In fact, the entire six-hour voyage out to this distant edge of the Chiloé Islands had been nothing short of spectacular, and I had seen something of the world. But I hadn’t expected it to feel like someplace out of a dream—my own best dreams. It took me off guard, since on the trip from Santiago I’d imagined a bleak sort of medieval penal colony. This was not only a picturesque seaside hamlet, it floated like a multifaceted emerald in an ethereal haze. With the sun at my back on the deck of the passenger launch, I was struck by the jeweled light. The island seemed suspended in a glimmering ocean of deep blues and greens—lapis lazuli, aquamarine, jade. The ragged cone of an Andean volcano hovered behind, on the continent. And before me, the wide central bay of the bow-shaped island spread out like a sea of prisms. It was low tide. A narrow black mud flat, studded with a glittering mosaic of shells, paved the edge of the bay. The briny odor of shellfish wafted on the wind. Off the port side of the launch, a robust island native knelt amid a garden of knobby wooden poles planted on the beach. The guy straightened up as the boat sputtered by and smeared his forehead with the back of his hand. The sun glanced off glossy blue-black hair. The launch pilot made straight for the grungy dock while pewter shingles and golden thatched roofs glided by. Some houses reigned from cliffs and crags, others peeked from virgin woods. Most were small, and all were probably shabby, close-up. But they were also old-world and homey. I released a long sigh. After these last couple of years, I was so ready for a retreat from the rat race of the capital. I longed for an oasis of provincial tranquility. So, I was fine with working in the Desertores for a school year. The farther from civilization the better, I’d told my father when he asked me to accompany him on this long-postponed research project at the end of the world. It would be a break—a change of pace—before I took up the challenge of becoming Mrs. Javier Palacios. 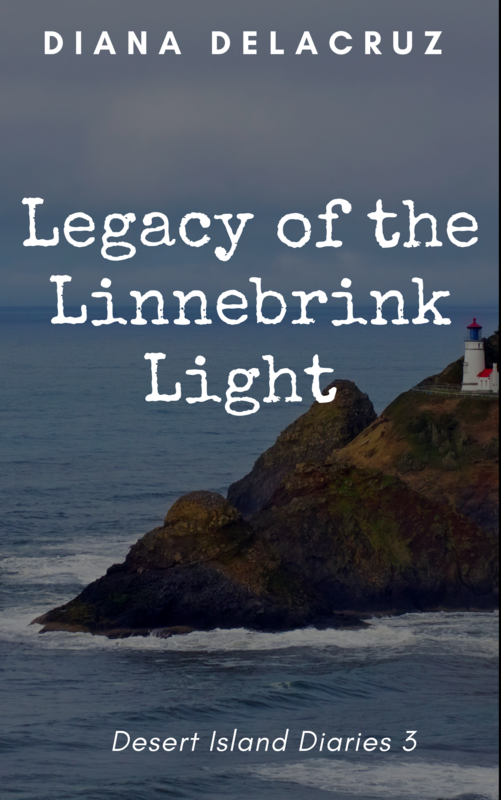 My dad, Dr. René Linnebrink, stood at the head of the dock. I’d recognized him the moment we swung into the bay. The shock of thick white hair leaped out from the huddle of other figures. The keen blue eyes still missed little, but his shoulders sloped these days. Poor old guy. Of course I was willing to tag along and make a little home for him in the wilderness. And the dreary wilderness I expected had turned out to be a taste of paradise. For today at least. I shouldered the oversized leather bag—a parting gift from my fiancé—and wobbled across the plank thrown between the launch deck and the dock. My father steadied me as I skidded in a glaze of fish scales. “I’ll see to the trunk then.” Don Tomás scurried down the dock toward the launch as the big man puffed up to us. Hmm, the locals always know when to beat it. “How do you do?” I swallowed back a wave of nausea. This islander didn’t even smell like wholesome fish and garlic. Body odor, mingled with cheap aftershave, reeked from him. Not so good, indeed. Flushed with the exertion of running, his heavy-jowled face was mottled like a red-pied bull. His corpulent chest still heaved beneath a tight shirt which gaped between the buttons and sported spreading sweat puddles at the armpits. Dark, greasy hair straggled around his collar. “Sí, sí, I understand. I’m certain this unfortunate start isn’t a sample of your customary work ethic.” He drew thick lips back over yellow teeth in a phony smile. Steam rose from my blood stream. I returned the smile—just as syrupy. “Oh, I’m certain it isn’t, señor.” Any more than this unfortunate stench is a sample of your customary aroma. “Please don’t do that, señorita.” Don Tomás was back near the ox cart, quietly laying a couple of planks as a ramp for my trunk. “I assure you, I’m a very ordinary and orthodox teacher.” The invisible hair on my hackles prickled. “Almost twenty-three.” My nerves were worn raw, ground down by his sarcasm. I got it then. Clearly the “desert” in the Desertores referred not to a geographical area at all, but to the vacant minds. The “deserters” had to mean brain cells that had defected. Whoa. Where had I landed?